Run or walk it off, crunch it away, whatever your preference, get rid of that belly fat. For years, it was believed that obese women were at lower risk for developing osteoporosis, and that excess body fat actually protected against bone loss. 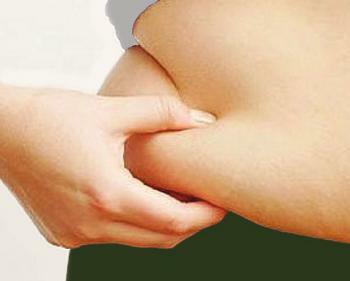 Recent studies show that having too much internal abdominal fat may, in fact, have a damaging effect on bone health. The Centers for Disease Control and Prevention in America defines obesity as having a body mass index (BMI) of 30 or more. Obesity is associated with many health problems including cardiovascular diseases, diabetes, high cholesterol, asthma, sleep apnea and joint diseases. Yet despite all the health issues, it was commonly accepted that women with increased body weight were at lower risk for bone loss. But not all body fat is the same. Subcutaneous fat lies just below the skin, and visceral or intra-abdominal fat is located deep under the muscle tissue in the abdominal cavity. Genetics, diet and exercise are all contributors to the level of visceral fat that is stored in the body. Excess visceral fat is considered particularly dangerous, because in previous studies it has been associated with increased risk for heart disease. Abdominal subcutaneous, visceral and total fat, as well as bone marrow fat and bone mineral density was evaluated in 50 premenopausal women with a mean BMI of 30. Each woman underwent an MR spectroscopy exam to evaluate the bone marrow fat of the L4, the fourth vertebra in the lumbar section of the spine. Then, the bone mineral density of the L4 was assessed using quantitative computed tomography (QCT), which measures bone mass and is used to assess bone loss. The imaging revealed that women with more visceral fat had increased bone marrow fat and decreased bone mineral density. However, there was no significant correlation between either subcutaneous fat or total fat and bone marrow fat or bone mineral density. The results showed that having a lot of belly fat is more detrimental to bone health than having more superficial fat or fat around the hips.